Kifah Abdallah watched as Nabeel and his sister Carole rocked on a chair together. “He is very protective of her,” she said. 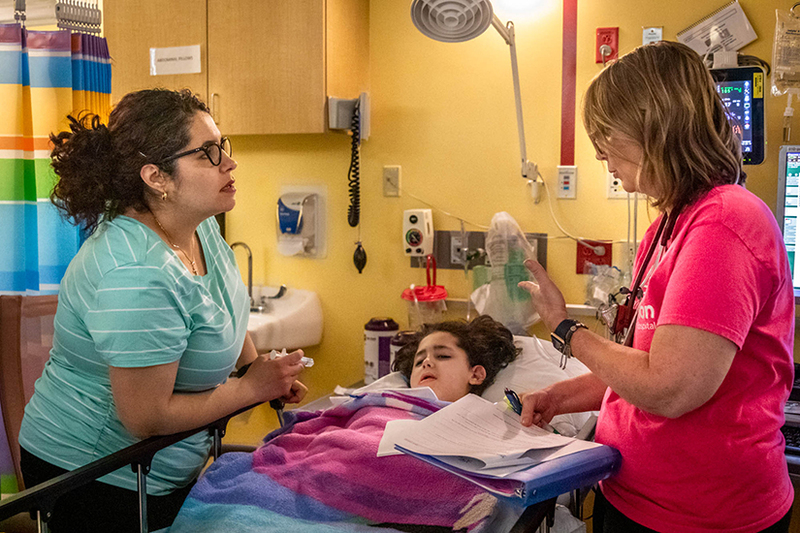 Through a connection with St. Rose Philippine Duchesne Church in Florissant and SSM Cardinal Glennon Children’s Hospital, Nabeel’s parents, Tariq Alkfoof and his wife Hibah Alkufouf, were able to come to St. Louis from Jordan for better medical care for their children. Hibah decided to do everything possible to keep him in a happy, loving environment, later doing the same with her daughter, Carole, dealing with seizures and much more. The children have a seemingly endless array of medical problems, including cerebral palsy, and are unable to walk and talk. Emil Alkufouf held his 5-year-old granddaughter, Carole. 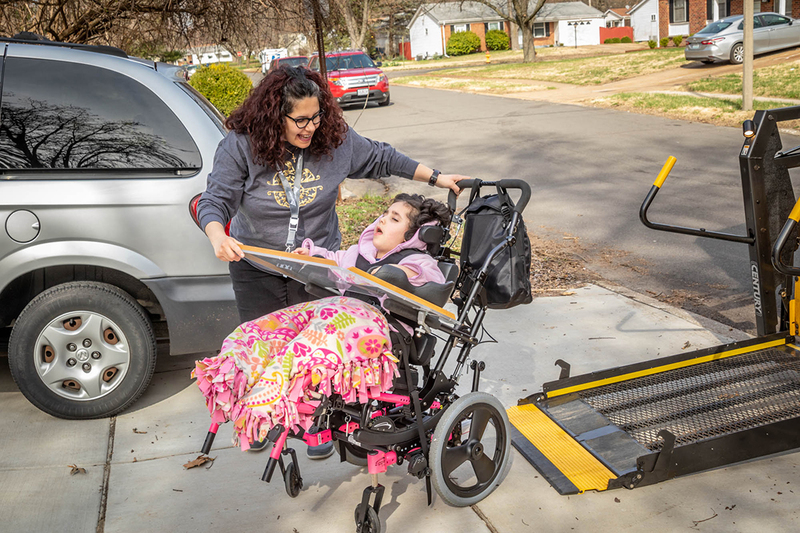 Carole’s parents, Tariq Alkfoof and Hibah Alkufouf, say they are grateful for the incredible support for their two disabled children they have found in St. Louis from Catholics and SSM Cardinal Glennon Children’s Hospital. The family attends St. Ferdinand Parish in Florissant. Nabeel, 9, and Carole, 5, received plenty of attention during a recent visit to their home in Florissant by Lesia Anstead and Kathleen Englert of St. Joseph Parish in Cottleville. Nabeel especially smiles and giggles when females show him attention and Carole is constantly curious and attentive. The two women from the St. Charles County parish and the family from Jordan laughed at the children’s reactions and joked about their families and cultural practices. 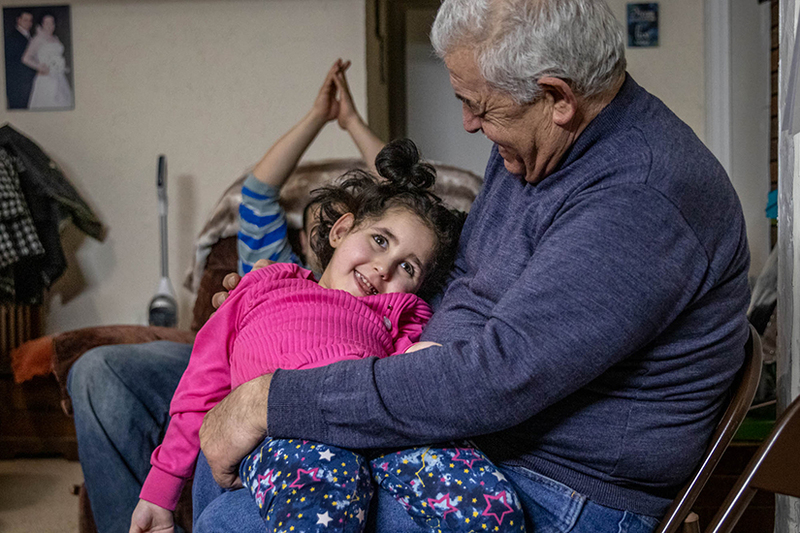 The St. Joseph parishioners are just a few of the people from the Catholic community in St. Louis who have supported the family of Hibah and her husband, Tariq Alkfoof, who are living with Hibah’s mother and father, permanent U.S. residents, in Florissant. The extended family from Jordan— Catholics who attend St. Ferdinand Parish in Florissant — not only rely on their faith to navigate the medical issues and related hassles but spread a surprising gratefulness, joy and deep love and devotion to their faith to anyone they meet. “The faith they have is in itself overwhelming. And the journey that they have had as immigrants is eye-opening to say the least,” Anstead said, noting the sacrifices that the family has made for medical care for their children. “You left your jobs, other family members, everything for your children,” Englert said to the family. Hibah agreed, noting that she left her brother and sister, cousins and others behind in Jordan, where few resources exist to help children with disabilities and complex medical problems. About four years ago while cleaning St. Rose Philippine Parish’s adoration chapel, the children’s grandmother, Badiah Alamamreh, spotted Bernie Geerling coughing. She gave him a glass of water and asked him to pray for her grandchildren, telling him of their special needs and a lack of services for them in Jordan. Geerling told Vincentian Father Bob Brockland who walked into SSM Health Cardinal Glennon Children’s Hospital and asked the receptionist who could help the family. The ball started rolling as the hospital got on board. Then the U.S. Embassy in Jordan got involved. The connection with Geerling occurred on a Wednesday, a day when Badiah normally doesn’t go to the chapel. Hibah noted that she obtained paperwork from SSM Health Cardinal Glennon that helped her get a visa. Normally, it takes four months to get a visa, Hibah said. She applied online, paid the fee, asked to schedule an interview and left a message noting that she was going to the U.S. for a medical reason. The next day she received an email telling her that she was scheduled for the interview the next week. A team of doctors looked over Nabeel, with several tests ordered, starting with a swallow test. The specialist told Hibah that her son is lucky to be alive since he’s aspirating (sucking food and fluids into the airway which causes pneumonia). “God is taking care of him,” Hibah told her. He had been aspirating for six years and survived, she noted. Hibah Alkufouf greeted her daughter, Carole, as she was coming home from school at the family’s home in St. Louis. SSM Health Cardinal Glennon and others helped facilitate the family’s coming to the United States from Jordan. physicians and therapists and emergency personnel who have helped the children. Tanios is co-founder of the SLUCare Complex Medical Care Program where she follows children with special health care needs. Hibah Alkufouf cared for her daughter Carole, along with post-anesthesia care unit (PACU) nurse, Carol Essma, after Carole’s dental surgery at SSM Health Cardinal Glennon Children’s Hospital. Msgr. Jack Schuler, pastor of St. Cronan Parish in south St. Louis, said the parish nurse at his former parish, St. Ferdinand, also assisted the family. The Hazelwood School District has been a big help to them as well, he said. He brought the family to speak to the youth group at Incarnate Word Parish in Chesterfield when he was assigned there. The teens were impressed and wanted to help, Msgr. Schuler said. They collected cans of nutrition drinks and one student got Priory student to raise funds for the family. Hibah came to a Mass to thank them. “She went on for five minutes talking about the Lord. And the celebrant said, ‘That’s the best homily we’ve had all year,’” Msgr. Schuler recalled with a chuckle. Several people have undertaken fundraising for the Alkfoof family on behalf of their children, Nabeel and Carole. Recently a restaurant and bar in Florissant heard about the family’s plight and hosted a fundraiser with a silent auction and more. A GoFundMe page helps with expenses. Most recently they sought funds for a van with wheelchair access. Insurance covers some medical expenses, but leaves a hole for modifications of their home for disability access and expenses for feeding and specialized care for the children. The foundation, led by the hospital’s board of governors, provides the financial support necessary for delivering exceptional health care, in state-of-the-art facilities, to all children in need of care. Through communication efforts, community cultivation, philanthropic generosity and Christ-like stewardship, the foundation’s purpose is to build strong partnerships that will result in world-class pediatric health care at SSM Health Cardinal Glennon Children’s Hospital. For information on how to donate, contact www.glennon.org or call (314) 577-5605 or 1-800-269-0552.